The model PDCPOEVA48AF is a DC to DC converter with Power Over Ethernet Injector output. 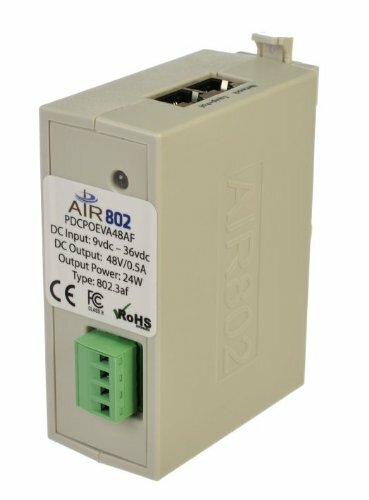 This product was designed and manufactured by AIR802 for use in applications where between 9 and 36 vdc voltage input exists and the equipment being installed requires IEEE 802.3af power-over-Ethernet (PoE) with 48 vdc and up to 24 watts of power. This model is designed for DIN rail mounting. There are two shielded Ethernet jacks on the top of the device. One jack is labeled, "Network" for network connectivity and will ordinarily connect to a switch, router, computer or other device as desired. The other jack is labeled, "Equip + PoE" and is the output jack with 48vdc. The model is for 10/100 Mbps interfaces. This model features dual input for the physical connection of two power sources, i.e., a primary and secondary power source. Other models available.